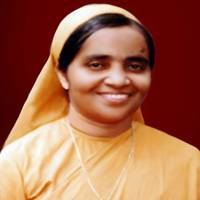 Sr. Mariam was born on 17th September 1950 as the 4th daughter among the ten Children of Kodupurathel Family at Karikkottakary in Kannur District. She was the member of the first batch of the Congregation Dinasevanasabha. After the completion of the Formation course at De Nomini College at Pune, she was appointed as the Novice Mistress. Sr. Mariam was elected as the third Superior General of the Congregation during the General Chapter conducted in 1989. She was the First Indian Superior General.